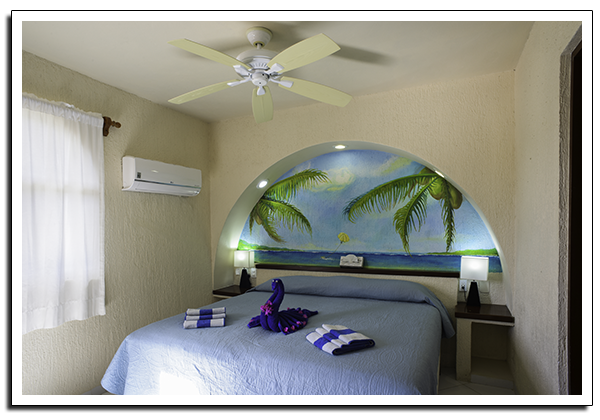 Villas DeRosa offers an alternative to our large beach front condominium units. On the jungle side of the same condo building, we have small hotel rooms that face the swimming pool. These rooms accommodate 2 guests comfortably with either a king size bed or two twin beds; and if needed we can provide a roll-away bed for a third guest. The hotel rooms have private bathrooms and a small balcony with a garden/pool view. Each hotel room will have a small refrigerator, but no cooking facilities. The hotel room will enjoy daily maid service, purified water, and free Wi-fi.